Solar physicists have long viewed the rotation of sunspots as a primary generator of solar flares – the sudden, powerful blasts of electromagnetic radiation and charged particles that burst into space during explosions on the sun's surface. Their turning motion causes energy to build up that is released in the form of flares. But a team of NJIT scientists now claims that flares in turn have a powerful impact on sunspots, the visible concentrations of magnetic fields on the sun's surface, or photosphere. In a paper published in Nature Communications this week, the researchers argue that flares cause sunspots to rotate at much faster speeds than are usually observed before they erupt. Their observations, based on high-resolution images captured through NJIT's 1.6 meter New Solar Telescope (NST) at Big Bear Solar Observatory (BBSO), come as something of a surprise. The sun's outer layer, or corona, where flares are released, has a plasma density about a hundred million times smaller than that of the photosphere. "It's analogous to the tail wagging the dog. The lower-density regions are much less energetic and forceful," said Chang Liu, a research professor of physics at NJIT and the principal author of the study, "Flare differentially rotates sunspot on Sun's surface." "We do think the rotation of sunspots builds up magnetic energy that is released in form of solar flares, but we have also observed conclusively that flares can cause sunspots to rotate about 10 times faster," he added. "This highlights the powerful, magnetic nature of solar flares." "Our new images allow us to not only confirm it, but to also characterize the time-spatial dimension of the sunspot's rotation – to describe its progressive, non-uniform rotation – as the flare travels through it," Liu said. "We used to think that the surface's magnetic evolution drives solar eruptions. 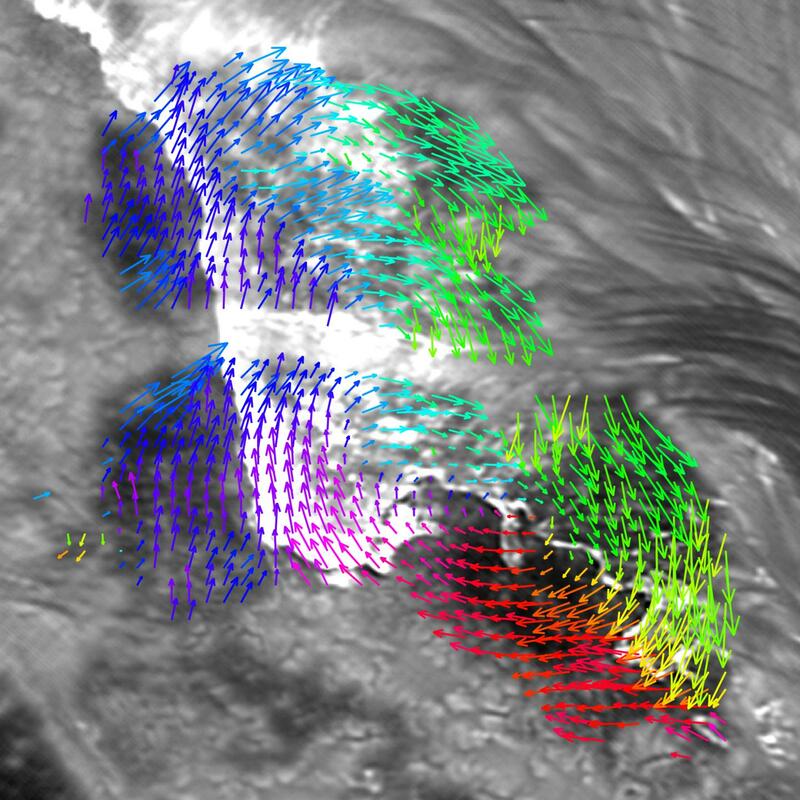 Our new observations suggest that disturbances created in the solar outer atmosphere can also cause direct and significant perturbations on the surface through magnetic fields, a phenomenon not envisioned by any major contemporary solar eruption models. This has immediate and far-reaching implications in understanding energy and momentum transportation in eruptions on the Sun and other stars," Wang said. "We will continue to study, and possibly re-interpret, the relationship between the different layers of the Sun." Images captured by NST, the world's largest ground-based solar telescope, are providing an unprecedented glimpse into the complex dynamics of the Sun's many layers, as well as insights into the massive eruptions originating in the solar atmosphere that are responsible for space weather. Last year, scientists at BBSO captured the first high-resolution images of magnetic fields and plasma flows originating deep below the Sun's surface, tracing the evolution of sunspots and magnetic flux ropes through the chromosphere before their dramatic appearance in the corona as flaring loops.